This entry was posted in Uncategorized and tagged anthropology, Levi-Strauss, Prometheus, The Grufallo, trickster by gavinmweston. Bookmark the permalink. Ah, but then this opens the question of how we are to interpret “The Gruffalo’s Child”! To summarise the ‘myth’: The Gruffalo narrates to his daughter the characteristics of the Big Bad Mouse, giving four particulars: Strength, a long scaly tail, eyes like pools of terrible fire, and whiskers as tough as wire. The Gruffalo’s child then sneaks out while her father is asleep and goes through a series of encounters with the animals of the previous book: the snake, the owl, the fox and, finally, the mouse, who scares her into running back to the safety of her father’s cave. Now, this book doesn’t display the symmetry shown in the previous one. Instead, it displays a succession of encounters that are partial reflections of the opening narration of the Big Bad Mouse. I think the way to approach this here is not with Lévi-Strauss’s symmetries but rather to think through the idea of the one and the many, particularly as it’s illustrated in Gregory Schrempp’s book ‘Magical Arrows’. The initial narration creates the all-fearful creature of the Big Bad Mouse as a whole encompassing four qualities. However, through the journey made by the Gruffalo’s Child these qualities are steadily spaced out and isolated from one another (as in Schrempp’s comparative accounts of Polynesian origin myth and the paradoxes of Zeno of Elea). First, the Gruffalo’s Child comes across what she thinks is the Big Bad Mouse’s tail—but it turns out to be the snake, a creature in its own right. Next she sees two great eyes gleaming out of a tree—but this turns out to be the owl. Next, she sees some whiskers poking from a hole—but it’s the fox. The wholeness of the Big Bad Mouse has been broken down, as each of it’s characteristics are formed into species of their own. After all this, she meets the (actual) mouse, who seemingly displays none of the qualities. Yet by using the power of the moon to cast a giant shadow, the one who is none of the parts creates (for the Gruffalo’s Child) the sum, the wholeness that is the Big Bad Mouse. 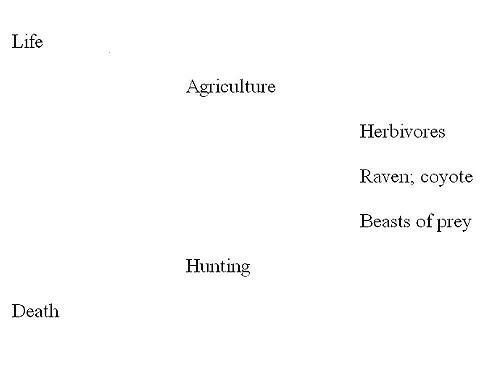 Thus, the mythical beast as a whole can be broken down into the discrete elements that are the different animals. However, only the animal who is not represented, not one of the parts, can be scaled up to become the whole. Right, I think we can step back and let the masters in Paris think through the implications of our findings. Awesome! My familiarity with The Gruffalo’s child is based on the animated film from two Christmases ago (there’s not a board book of it for some reason and Nye still thinks books are edible). I LOVE your interpretation but I’m tempted to also see a meta-symmetry across the two stories, the mouse having taken on the fearful role of the Gruffalo at the end of the last story now starting to subsume characteristics of the very animals he feared to begin with (through the tail, the eyes and the whiskers). But mine is a cursory analysis – I will have to read it to properly internalise the dynamics of the story. 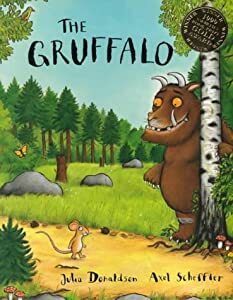 On reflection, I think I downplayed the link between the two — I’d be willing to argue in favour of a metasymmetry, particularly because there’s very little reason for the division and recombination in The Gruffalo’s Child without the mouse to re-anchor it to the previous narrative at the end. A second opinion would certainly help take the analysis to new heights. I’d go for a metasymmetry. The Gruffalo’s Daughter, which does have a board book version because we have one, ONLY really makes sense as an extension of The Gruffalo. But, I do like the way Hugh has so masterfully analysed it in its own right. You are BOTH, by the way, over thinking these masterpieces, but the people I work with in Pakistan tell me I over think just about everything they do, so perhaps it’s an occupational hazard of anthropology. We take a lot of ostensibly trivial things pretty darn seriously. My desire to push the Grufffalo analysis further is almost overwhelming. Part of me wants to run a conference on frivolous anthropology just to write it (although the frivolous anthropology conference might just be me presenting 20 papers on random crap I’ve overthought). I am currently overthinking the ambiguous moral content of early Thomas the Tank Engine stories and the unknowability of exact meanings in the magical realistic portrayal of Duck and other characters in Sarah and Duck.